The Snake Jade Base is a Limited Edition base and can no longer be acquired by Hunters. Calamity Carl commissioned this base to celebrate the Year of the Snake Festival, and by pure coincidence has hired the same Trapsmith from last year. This year's carvings carry similar magic to last year, though the power of the Snake manifests as a love bite for extra attraction! Only hunters who have helped Carl complete a full cruise and saved up sufficient Cruise Bux will be able to have their Jade Base carved into this attractive and fantastic base! The Snake Jade Base was available for purchase for 525,000 gold, 1 Jade Base, and 1000 Cruise Bux from Calamity Carl's Cozy Cruise Trapsmith during the Year of the Snake Festival once the Captain's Hat was obtained. It could not be refunded. A complete list of Lunar New Year Bases can be found here. 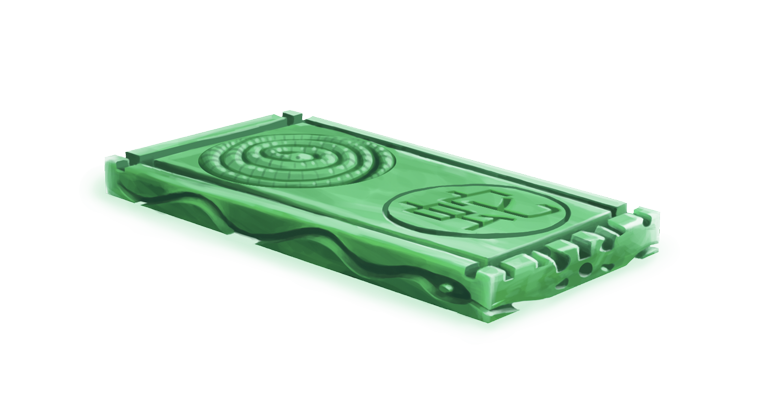 11 February 2013: The Snake Jade Base was introduced during the Year of the Snake Festival. This page was last edited on 14 January 2019, at 13:55.